As a Diagnostic Radiographer you will use sophisticated imaging technology and a range of specialist modalities including digital radiography, magnetic resonance imaging, computed tomography, radionuclide imaging and ultrasound. With a Diagnostic Radiography degree your key role will be to provide high quality diagnostic images to aid detection, monitoring and management of the patient's illness. Changes to the traditional methods of healthcare provision mean entry-level graduate Radiographers are increasingly involved in extended roles including image commenting, image interpretation, report writing, patient treatment and prescribing of medications. These emergent skills require high levels of analytical, problem-solving and research skills. This course has a 96% student satisfaction rate, and 100% of graduates go on to work and/or study six months after finishing the course - Unistats, 2018. You’ll study applied radiographic anatomy and pathology and as well as professional identity, ethics and values and radiographic practice. Interprofessional learning with other healthcare professions is experienced before the clinical education placement when you’ll integrate academic theory and personal reflection to clinical practice. Research is threaded throughout all four stages of the course. Student knowledge of radiographic practice will be extended beyond skeletal imaging to include contrast media studies, trauma imaging, screening services and a diverse range of patient and user groups. You’ll undertake a clinical education placement and a short situated learning experience in a care environment. In addition to interprofessional learning you’ll refine reflective practice skills and consider values within health care. You’ll take increasing responsibility for individual learning and decision-making, increasing your competence in clinical practice. You’ll learn highly specialist advanced practice roles in radiography and the professional, medico-legal and ethical implications of such developments. You’ll undertake an elective placement and interprofessional practice placement as well as multi-professional study of research and investigative methods. Your research project and Interprofessional learning will develop your skills in research, leadership, management, partnership working, service redesign and quality improvement; and prepare you for future career progression. 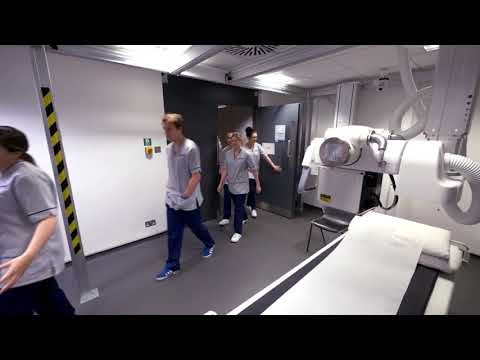 The clinical education presents similar scenarios to those encountered by a newly-qualified Radiographers, to promote a seamless transition to working life. Each year of the course comprises two semesters and consists of academic and/or practice placement modules. Academic modules are studied within RGU and include lectures, tutorials, seminars, workshops, group work and practical sessions, including simulation in the X-Ray Suite and Clinical Skills Centre. Academic modules may be delivered to course specific disciplinary groups or in a multi-professional manner alongside students from other healthcare disciplines, preparing you for practice in the wider healthcare environment. Practice placement modules are delivered in a wide range of Radiography settings in NHS and private facilities across the North and East of Scotland. In addition to face-to-face lectures and tutorials you will spend time outside of class working on your own, doing prescribed reading, preparing answers to tutorial assignments and researching and writing course reports. All members of the academic staff team are qualified Diagnostic Radiographers registered with the regulatory body, the Health and Care Professions Council (HCPC). In addition they are all members of the professional body, the Society and College of Radiographers (SCOR) and have all completed a Post Graduate Certificate in Higher Education Learning and Teaching. Academic staff members possess both subject-matter expertise and the relevant clinical experience. In addition, external input from experienced clinical practitioners ensures currency and relevance of content. We arrange for all students to rotate around a range of placements, giving you experience of the spectrum of radiography roles. Past placements have been in major regional centres, district general hospitals, community hospitals and remote hospitals and extend across Grampian, Highland, Tayside, Perthshire, Fife, Orkney, Shetland, the Western Isles and other locations. You will also be required to organise an elective placement which offers a global element to your training. In addition to hospital based practice education, you will undertake a unique specialist contemporary practice placement in a care home/community hospital setting to focus on the development of patient care skills. As Scotland's health service continue to undergo rapid change and modernisation, the philosophies of this course reflect the policy agenda of the The National Delivery Plan for the Allied Health Professions (AHP) in Scotland, 2012 – 2015. Over the last ten years the AHP workforce in Scotland has increased by over 30% which reflects the growing need for professionals with a diverse range of specialist skills who can make a vital contribution as first point of contact practitioners to diagnostics, early rehabilitation and enablement. Diagnostic Radiographers are in greater demand than ever and are often involved with the widest range of patients of any of the healthcare professions. The integrated Master of Diagnostic Radiography curriculum will allow you to extend your competence, knowledge and skills beyond those required of an entry-level practitioner. The course facilitates a professional body drive for research-active Radiographers and the integrated Master's course is effectively a stepping stone to meeting the increased research expectations of the professional body. You will have the opportunity to enhance your knowledge in the areas of leadership, partnership working, service redesign, quality improvement, public health and health promotion, inter- and multi-professional team working, population health and research. All of this enhances your employability and future career progression. SQA Higher: BBBC to include English (or a written subject requiring the use of English) and two from Biology/Human Biology, Chemistry, Maths and Physics. GCE A Level: BCC to include two from Biology/Human Biology, Chemistry, Maths or Physics. English at GCSE grade 6/B if not held at A-level. Irish Leaving Certificate Higher: H2H3H3H3 to include English (or a written subject requiring the use of English) and two from Biology, Chemistry, Maths or Physics. IB Diploma: 27 to include Higher Level English (or a written subject requiring the use of English) at Grade 5 and two from Biology, Chemistry, Maths or Physics at Higher Level. Equivalent qualifications, e.g. SQA, BTEC, S/NVQs, overseas qualifications and access programmes will be considered on an individual basis. Applications from students with non-standard qualifications or work experience are welcomed. Applicants whose first language is not English should have an IELTS of 7.0 overall, with no component lower than 6.5, or an equivalent. These are the requirements of the HCPC and supersede the standard University English Language requirements. At the beginning of your course and during all practice placements you are required to purchase and wear an official uniform. If you are a student from Scotland, this uniform will be paid for by the Scottish Government. All other students (the rest of the UK (RUK) and international students) will have to purchase a tunic at £5.59 each and trousers at £7.04 each. Where uniforms become damaged or for any other reason unsuitable, you are responsible for the cost of the replacement. With this course, you get to see a range of hospitals and it gives you an insight into the varieties of opportunities available to you. You get to travel all around Scotland going on placements and is definitely a unique opportunity and what I enjoyed the most! The course is approved by the Health & Care Professions Council and the College of Radiographers. The Radiography Suite sits within the Ishbel Gordon Building and contains industry standard equipment for clinical skills practice. The Clinical Skills Centre is situated in the Ishbel Gordon Building. It has a number of different rooms and laboratories purposefully designed to practise clinical skills. This Occupational Therapy degree at RGU will provide you with the skills to make a difference, working with people to overcome challenges in their lives. Working in a range of ways with individuals, groups and communities, you will use your specialist Occupational Therapy Skills to enable people to overcome challenges to participate more fully in life. As a Physiotherapist you’ll work to promote patient’s health and wellbeing, and restore their movement and function to as near normal as possible, in a wide variety of health settings; from intensive care units to Premier League sports clubs. As part of the physiotherapy degree you’ll have the opportunity to make a positive difference to patient’s lives in this rewarding career. As a Dietitian you will be a registered health professional who uses knowledge about food, science and the human body in health and disease to educate and give practical advice to patients, colleagues, clients, carers and the general public. You will have the ability to work with patients to change lives, and contribute to the welfare of society.